Notes: Special thanks to Tom Posthuma and Brian Sodergren for the information on this. Hi i was wondering what years the track was in operation 'I found a trophy ata resale shop from there. I am the son of nick the owner of nicks 41 track I would like to see some pictures from back when it was open if anyone has any pictures just contact me on my email. Cool web site. Just picked up a 1969 Copo Camaro that was at Nicks alot. Its black and Bob Kivela owned it at that time. It had Kivela and Swift on the door. Found it in Beaver Grove about a year ago. It was sitting for 40 years!Talked to Bob and he remembers it like it was yesterday. Going to start a concours ground up restoration on this very special car soon. There are only twelve know black 69 copo Camaro on the planet. And this one was a regular at Nicks. How cool is that. And it was very fast. Does anyone have any pictures of this car?or movies?thanks. 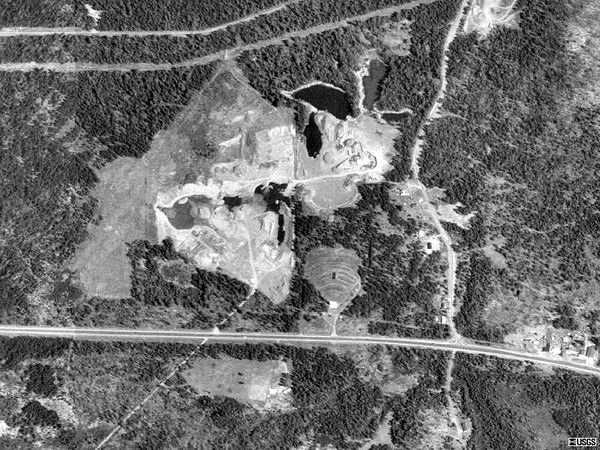 The gravel pit and recently constructed ready mix plant have made it hard to tell what was what on the site. The starting line area was on the south west end of the property and can still almost be seen from US41. I remember driving by and hearing the cars doing burnouts and seeing the tire smoke from the highway. The shutdown was on the north east end of the property down by the power line. It was short and some ended up going off the end of it. Entry was from down by the Evergreen drive in. All these years later the track is still somewhat of a mystery as to where it was on that property. The faint layout of the X is visible even with the gravel pit in the picture at the bottom of the page. Go to Google Earth now and we have clear shots but the gravel pits seems to have expanded across the whole site. Did it run from near the drive in theater northwest towards the powerlines or from the southwestern end northeastward?. I worked at TRI/S Performance in Escanaba. Knew many dragracers of the middle to late 70's. Fran Bergquist with his Snuffbox Chevy. John Wiles w/black camaro, Bob Lange 72 Comet w/Boss 351. Pat DePetro with his bike, are just a few. Bob and I ran his 72 Comet for a couple of years. (as well as running it on the street) and had a blast!! Nick's was great! an easy tow, and fun people! We also campaigned a 70 Maverick Mad Maverick w/Boss 351at first then updated to a Boss302. Ran best of 11:37 @ 120, @ Kaukauna, but mostly ran at Nick's. Never forget rain!!! But sometimes we ran on track to dry it off! Jeepers! I remember my friend Bob running against a corvette, w/damp track! 3 times. LOL Great memories and greatly miss those days! and yes we sponsored drag events at Nicks 41, when I worked at TRI/S. I Hope someone may have pictures of the Comet or the Mad Maverick! Thanks for having this here!. I used to walk here through the woods to watch the drag racing. one time I was the only one in the stands (paying customer). It is mostly grown in with aspens now, hard to tell the X of the old landing strip (one grass runway north-south and one east-west). I used to pick berries here with my Grandmother before the track was built. I had two plane rides here - a guy that worked with my dad at the Tracy Mine had a Cessna - before the track existed. I walked into the old site the other day. All that is left now is some crumpled black top chunks where the shut down was. The rest of it has been completely excavated because it is being used as a gravel pit. I am glad I got to go there a few times before it closed down. I Raced a 1973 900 Kawasaki - 1973 GTO - bike time 12:60,Car Time13:70Pat DePetro Drove My 400 Kawasaki Till He Got His Own Ride,ItWas A blast. Unfortunately this track was closed before I came about, however I hear stories fairly often. My father (Pat DePetro) and uncle (Ken DePetro) used to run drag bikes powered Kawasaki 750 two-stroke engines. 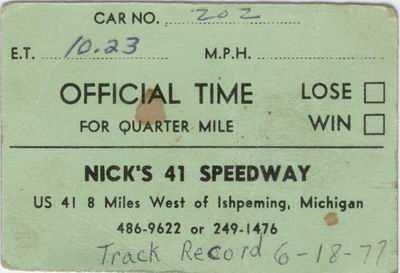 My father''s bike was the quickest of the pair and the fastest time it recorded at Nicks 41 Speedway was a 10. 23 E. T.
(June 18th, 1977). It is hand written a track record 6-18-77 and I also have a Newspaper clipping that I laminated. It is a neat piece of nostalgia from Nicks. 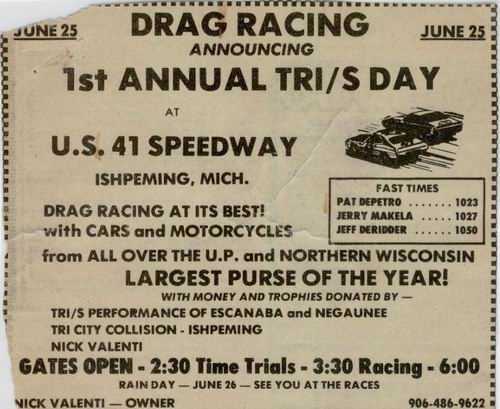 It is titled annual Tri/S day at U.
S. 41 Speedway (June 25th, I am assuming it was 1977) and it lists the three fastest times as follows: Pat DePetro (10. 23), Jerry Makela (10. 27), and Jeff Deridder (10. 50). I also have a few photos, a couple 8mm videos (though very dark and hard to see what your are watching), and several time slips from Nicks. I would like any photos and such that anyone would have of my father. I will try (or have the admin) to upload a photo of the paper clipping and time card. When Nick Valente came up with the idea of a local dragstrip in Ishpeming, there were several of us that offered our time and whatever talant we had to make this a reality. The site he chose was good because it was flat (an old airstrip) and available. Originally it was to have a 1/2 mile oval along with a 1/4 dragstrip. More work had to be done to get the oval up and running so that part of his dream fell by the wayside early in the construction stages. If he would have positioned the drag strip differently (without the oval) the shutdown could have been longer and faster cars could have raced. Those of us that had 11 second cars really had to get on the brakes hard to stop before hitting an IRON GATE! As time progressed we had a paved pit area, a paved return road, a set of bleachers for spectators and a 2 story timing tower. We started out with a flag man start and a stop watch finish, to a homemade christmas tree (out of an erector set) to a full Chrondek timing system. I can''t remember if there was a concession stand or not. My 60 year old memory is failing me! I do remember that it cost very little to race and the money we won barely paid for the gas, let alone if we broke something. Alot of people remember Sody (that''s me) and my lil'' yellow truck. There were times when I dumped the clutch that I didn''t know which direction we would go! Thanks to Paul Kaminen we had her tuned & twicked as far as we could. Lots of great memories shared by lots of great people. I still see Nick often and we still talk about those days. If only we could go back to those times!. Plans for new dragstrip coming soon in the Mackinac County area. Get on e-mail and mailing list by contacting us at trackmanagers@gmail. com. Oh,what a cool site. I remember Nick,s. Raced a 69 Z/28. 14. 1 best Things I recall,bittersweet are Paul K(the man) Mungy Makela 68 dart and drag bike Kung FU (seems it was always Kung Fu and Jerry in finals) Sukatash,Wild Weekend,Saturday Night Special,Jonathan Pietala,George Miljour,Dean Larson,cars coming down from Houghton area,Tequila Sunrise,Dennis and doug Karhi,Bartanen's Chevelle,Quick Carl,Laterno avd Ed Lorenz,DePetro bros. Waiting in line along 41 for Niick's to open. TRI/S day big turnout. i am sure I have missed many,many cars and guys. Let's hear from some more racers and fans. It was so great to have a strip right here,hooked me on drags for life. If memeory serves me right,tech was a puke can and helmet. What a great time,open up your headers and race! Paved pits and return lane. In the mid 70s I built a drag bike to run at Nicks. IT was light, 225# ready to go. At first it ran a 793 Hirth and later a 650 Polaris, both 3 cyls. The Polaris was quicker and faster but broke piston skirts due to extensive porting. Either version would run mid 10s all day long the Polaaris being about 2 tenths quicker and 5 mph faster. The best it ever ran was 10. 31 at 131. 92 at Kaukana we made it to the final round and broke out on a 10. 35 dial. With snowmobile clutches it ran consistently and made an excellent bracket racer. With modern snowmobile engines and clutches it would be no problem to put together an 8 second ride. Nicks was a great time, gone but not forgotten. I may be mistaken but there was a pontiac powered altered that ran there a few times that hit the 9 second range. I remember it had a plastic mail box for news papers as a scoop on top of the tunnel ram intake. LOL I met the guy at WIR a couple of years ago , and he was from Iron Mountain. Nicks 41 speedway is where it all started for me as a kid. I made my very first 1/4 mile pass on a motorcycle there at 12 years old on my 1972 honda SL-70. that was in 1974. I live in Green Bay WI now and I have been dragracing a motorcycle at WIR in Kaukauna now for the last 5 years. I have many fond memories of Nicks 41 speedway 1969 Nova called the Rapper , Kievela & Swift 69 camaro , Sodys lil yellow truck, Paul Kaminens big triple dragbike , and many more I do remember. I just took a look at that timeslip I found while rumaging around at Nicks (story below), and saw that the guy ran a 12. 16. E. T. This would have been one of the faster cars out there. A handful of the cars would run in the elevens but a short shut down area kept the really fast cars from running there. I believe the fastest ride was Paul Kaminens home made drag bike. It sported a 3 cyl snowmobile engine and clutch and would run in the tens. They would often tune it up before the races right on the road in front of my parents house. I remember driver Jerry Makela screaming by at over 100 mph with hair blowing in the wind. A tee shirt and jeans with no helmet were the norm. The road would be decorated with mean looking slick marks afterward. Very exciting for a 13 year kid to see. 41 Speedway is now the site of a gravel pit. The Evergreen Drive In right next to it was torn a few years ago after sitting vacant since the 80s. Sad to see after so many fond memories were made there. I cringe every time I drive by. This track closed in the mid 70s. As luck would have it by the time I got a car and drivers license in 1980, the track was long gone. I fondly remember going there when I was a kid. My 57 chev that I own today used to race there. Back then it seemed everyone was banging gears with a 4 speed which really added to the excitement. Today I own some property right at the end of the shut down area. A couple of years ago while walking around there I found an old overturned garbage can. I rummaged through a bunch of old sugar free Tab cans etc and found a legible 12 sec time slip with track name address and phone number! I kept it along with a broken chunk of asphalt for a souvenir. Today the closest track to Ishpeming is Kaukauna Wi, 3 1/2 hours away. Sure wish someone would open a track around here!. This 1/4 mile drag strip was built in the early 70s on the grounds of the old Dexter Landing Field on US-41 near Ishpeming. Coincidentally, the Evergreen Drive-In was on the lot next to it! By all accounts this track was non-sanctioned and was built by racing enthusiasts who felt that the old runway would make a great drag strip! Initially the track was very basic, there wasnt even a real Christmas Tree for starting a race, so one of the racers fabricated one using an erector set! This was eventually replaced with a Chrondek timing system. The track ran for several years but sometime in the late 70s or early 80s the owners of the land, (CCI) Cleveland Cliffs Iron, who owned the mineral rights under the strip decided they needed the land back. The lot is still vacant today although it appears an access road has been built.